Over the past several years, there has been greater understanding about the dangers Sleep Apnea can pose to patient safety in a healthcare environment. Patients with or with risk factors associated with Sleep Apnea are much more difficult to manage in terms of anesthesia and show greater sensitivity to pain medications. Because of these risks, healthcare professionals are taking steps to identify patients who should be monitored more closely for distress. 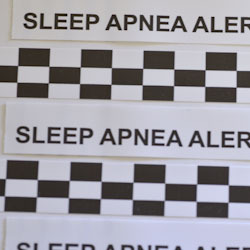 Because of the high rate of people who have Sleep Apnea, but are not professionally diagnosed, EasyID, in association with a large health system in Colorado, developed a quick and easy method by using a custom designed alert band -to- wristband to both determine risk to hospital patients and also alert caregivers that a patient has or could potentially have Sleep Apnea. In male patients, the risk of having Sleep Apnea greatly increases when the patient has a neck size (circumference) of 17 inches or greater. In female patients, that measurement is 16 inches. Because of that fact, EasyID designed an alert band that is 17” in length so it can be used as a “measuring tape” in addition to being a regular alert wristband. The band is perforated at 11” so that once a measurement has been taken, you can attach a standard size wristband to the patient. 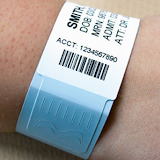 By providing hospital caregivers with a visual notification of risk by using a wristband, specific precautions can be taken to ensure the patient receives the best care possible.